The supermassive black holes at the cores of most galaxies could be spinning at a dizzying rates. These celestial monsters may be rotating so fast, they are close to the maximum rates allowed by Einstein's theory of relativity, a study finds. The research is based on observations of nine giant galaxies using Nasa's Chandra X-ray telescope. Astronomers presented the results at a meeting of the American Astronomical Society in Austin, Texas. They suggest these gigantic gravity wells complete one rotation every day. This may not sound like much, commented co-author Rodrigo Nemmen, but for objects of this size it is extremely rapid. "The spins of black holes hold the key to puzzles in astrophysics," said Mr Nemmen, a visiting graduate student at Pennsylvania State University. "The spin can tell us how black holes are born and grow, as well as how jets and gamma-ray bursts work." A rapidly spinning black hole makes space itself rotate. This effect, coupled with gas flowing in towards the black hole, can produce a magnetic field which flings a large amount of the gas away from the vicinity of the black hole as an energetic, high-speed jet. In one second, these jets typically discharge fifty times the amount of energy that is radiated by our Sun in one year. They even affect galaxy growth by suppressing star formation. Mr Nemmen's team compared the Chandra data with theories of how the jets are launched by supermassive black holes. They found that, in order to reproduce the X-ray observations from Chandra observations, the black hole rotation driving the jet had to be extremely fast. 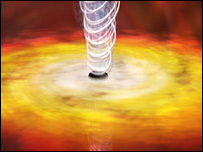 Slower spinning black holes simply did not agree with the data. "The black hole spin is between 90% and almost 100% of the maximum rate allowed by theory. This implies that the biggest black hole masses in the centres of giant galaxies are also associated with big spins," said Mr Nemmen. In other news at the AAS meeting, Nasa astrophysicists announced that black holes are capable of producing a bizarre special effect called a light echo. Bursts of X-rays are sometimes emitted by hot spots within the discs of searing hot gas that whirl around many black holes. Many of the X-ray light particles, or photons, travel to Earth via different routes around the black hole. Because the black hole's extreme gravity warps the surrounding space-time, it bends the trajectories so they reach us with a delay. This delay depends on the relative positions of the X-ray flare, the black hole and the Earth. However, Keigo Fukumura and Demosthenes Kazanas from Nasa's Goddard Space Flight Center in Maryland calculated that if a black hole spins very fast, the interval between the X-ray photons reaching Earth becomes constant. For every X-ray burst from a hot spot, the observer will receive two or more flashes - echoes of the original burst - separated by a constant interval.